This has been out a while, but if you haven’t read How and Why SpaceX Will Colonize Mars, you don’t have to – you can listen to the audio version instead! Speaking of space, I’m intriguged about NASA’s announcement that they solved an open mystery on Mars, and I’m excited to hear what it is. And the images of Pluto from New Horizons are stunning. And there is a supermoon lunar eclipse this weekend! Hey, remember how I got a car, brand-new, in 2011? We were devastated to hear the news that we didn’t get what we paid for, and are awaiting the fallout. It is likely the car will be recalled and updated to meet standards (impacting performance), and some sort of compensation will be due. I had a chat with my manager the other day, and we jointly discovered that I was not eligible for this year’s pay increase cycle since I started 1 week after the cutoff date. I was expecting as much. He then said, “Well, you negotiated quite well when you started, so it isn’t likely there would have been much increase anyway.” I smiled. I know I’m making more than a lot of long-time employees, and I’m almost certainly the highest paid person with my title right now. I knew raises would be hard to get, so I asked for every single penny (even though I had expected the offer to be 15-20% lower than it was). So, negotiate hard (H/T Spend, Save, Splurge). It is the only time you have all the power. It is bad enough that women actresses get asked inane questions about balancing work with kids when men with children don’t. But at a tech conference, it is shocking that one of Silicon Valley’s most powerful women was asked if all her children had the same father. I expect better than “grandstanding dog and pony shows, designed to trot out successful women and demean them by asking them, “How do you do it all?” as if they are crazy for pursuing their careers as their male cohorts would.” Cringing. Why is Gayle King the moderator??? I almost never share anything serious on my Facebook, but I shared to a post about one father’s plan to set up a fund for his daughter and not his son in an effort to combat unequal pay. The first comment was from a guy who said the pay gap exits but was overstated and largely due a lot to women having children (which the article discusses in detail, but I doubt he read it). OK, thanks for the man-splanation!!! (I wish I said that. I really said that the article talked about that, and that the birth itself is only 3-4 months off work thanks to our terrible maternity policies, and it is impossible to separate “lifestyle choices” from societal pressures and expectations that the woman is the primary caregiver, career or not. Now I remember why I don’t share things on Facebook. 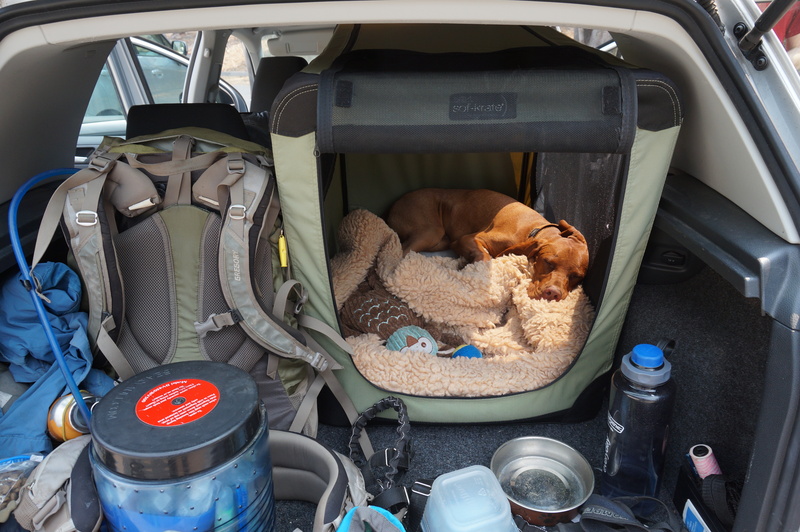 And now, another photo of my dog, all tuckered out after our backpacking trip earlier this month. At first I felt a little bummed when you said you missed the cutoff for a raise but was then happy for you that you had negotiated so hard to begin with that you were already making the raise 🙂 Good for you. I always wish I had been more aggressive with asking for what I wanted! Yeah, there is basically no chance an exception can be made. I was expecting this, so it isn’t frustrating, but more money is always useful!. Definitely one of my frustrations with being at large companies. Ah well. I had a similar problem at my last job and the cutoff was insanely early – you basically had to be there for the entire 12 months of the review period to get a bonus. If you negotiate well for your job’s salary from the get-go, all your increases become higher and higher as a percentage of that. It’s the biggest salary bump you’re ever going to get going from college –> work or from job –> job. I’m such a huge fan for fighting hard for your $$$$ & I love hearing others succeed in doing so. Oh and to your point about women getting asked inane questions, not a single person asked my partner how he would handle having a newborn & his job. NOT A SINGLE ONE. Oh wow, that panel sounds cringeworthy. I missed out on salary reviews at my last job (annual review time was about 3-4 months after I started, and apparently if I had started at the start of April rather than the end I might have been eligible… but really I don’t imagine they would have given me a raise so soon). And then I wound up resigning right before reviews the following year, plus my boss left, so didn’t happen then either.